1Department of Anesthesiology, Nagoya Kyoritsu Hospital, Nagoya, Japan. 2Department of Anesthesiology, Tokyo Womens' Medical University, Tokyo, Japan. Received: July 6, 2016; Accepted: August 2, 2016; Published online: June 22, 2017. TO THE EDITOR: Bone marrow examination is a common procedure during the diagnosis of hematological disorders such as acute and chronic leukemia, non-Hodgkin lymphoma, and aplastic anemia. It is usually performed on the posterior iliac crest or the sternum. Although rare, a serious complication may occasionally occur when it is performed on the sternum due to the anatomical localization of the vasculature (ascending aortae) just beneath the sternum . The injury mainly results from the use of an incorrect needle length according to the sternal bone width and is mostly life threatening. 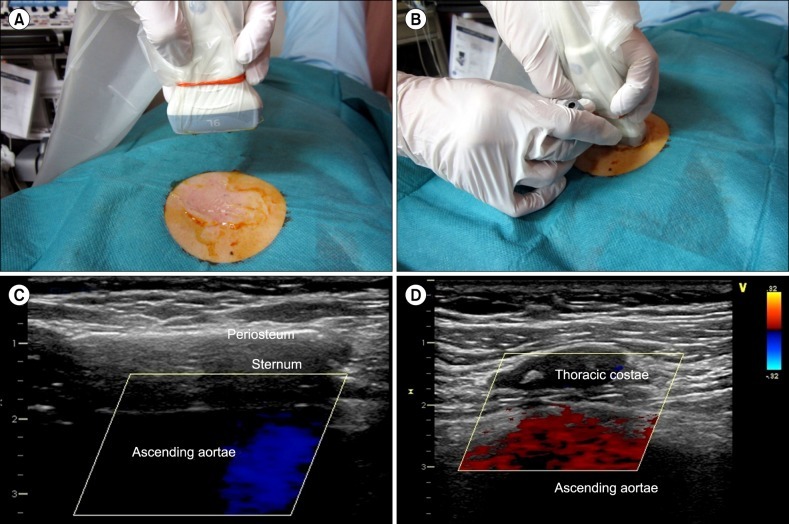 Here we describe a novel sternal bone marrow aspiration technique, named “ultrasound-guided sternal bone marrow aspiration,” which enables the decrease of such risks to nearly zero. The high-resolution ultrasound imaging modality with a linear probe of a frequency higher than 8 MHz and a sterile probe cover (CIV-Flex Transducer Cover, CIVCO, Iowa, USA) were used (Fig. 1A). A linear high-resolution ultrasound probe with its frequency at 9 MHz (Vivid-E9, GE, San Jose, CA, USA) was applied perpendicular to the long axis of the sternum to obtain the image (Fig. 1B). The sternum is identified in the center of the figure as a hypoechoic structure surrounded by the hyperechoic periosteum (Fig. 1C). The image clearly reveals that the depth from the skin to the sternum is approximately 1 cm, and the width of the sternum is 1 cm. Considering the pressure that potentially would decrease the depth from the skin to the sternum during the puncture of the needle, the needle depth was adjusted to 1.3–1.5 cm. Just beneath the sternum, the blood flow of the ascending aortae is clearly visible using a B-mode ultrasonography with a color flow imaging (Fig. 1C). Since bony structures have high ultrasound absorption coefficients, we suggest that the probe be applied just beside the sternum, longitudinal to the body trunk for cases in which the blood flow and depth of the ascending aortae are not visible. The thoracic costae can be identified as a hypoechoic circle just in the center of the figure (Fig. 1D). The depth of the ascending aortae is measured as 2.5–3 cm from the skin (Fig. 1D). Finally, using an out-of-plane technique , an aspiration needle is inserted (Fig. 1B). In brief, the probe is applied perpendicular to the long axis of the sternum and adjusted to show the sternum just in the center of the screen. Next, the needle is positioned in the middle of the transducer and punctures the skin at the same distance from the transducer to the sternum at the depth estimated from the screen. By rotating the transducer probe, the needle tip is clearly visible during the aspiration procedure. Recently, ultrasound guidance for central venous catheterization as well as for peripheral nerve block has gained popularity and been shown to reduce the rate of complications . We have shown that ultrasound guidance for sternum bone marrow aspiration may potentially eliminate the fatal complications associated with cardiovascular injury. (A) A 9 Mhz linear ultrasound transducer probe covered with a sterile probe cover. (B) A sterile linear ultrasound transducer probe was applied perpendicular to the long axis of sternum. The needle is positioned at the middle of the transducer probe and punctures the skin using “out-of-plane” technique under the total ultrasound guidance. (C) A typical ultrasonogram of sternum. The depth from the skin to the sternum is measured as approximately 1 cm with its width approximately 1 cm. Sternum, a bony structure, has high adsorption coefficient of ultrasound, and is visualized as hypoechoic lesion surrounded by the hyperechoic periosteum. Beneath the sternum, a blood flow of ascending aortae is clearly visualized using B-mode ultrasonogram with color flow imaging. (D) A longitudinal view of the mediastinum just beside the sternum. In the center of the view, a thoracic costae is identified as a hypoechoic circle surrounded by the hyperechoic periosteum. Beneath the thoracic costae, blood flow of the ascending aortae is identified using B-mode sonogram with color flow imaging. Santavy, P, Troubil, M, Lonsky, V. Pericardial tamponade: a rare complication of sternal bone marrow biopsy. Hematol Rep, 2013;5;e13. Song, IK, Choi, JY, Lee, JH, et al. Short-axis/out-of-plane or long-axis/in-plane ultrasound-guided arterial cannulation in children: A randomised controlled trial. Eur J Anaesthesiol, 2016;33;522-527. Asakura, Y, Kandatsu, N, Kato, N, Sato, Y, Fujiwara, Y, Komatsu, T. Ultra-sound guided sciatic nerve block combined with lumbar plexus block for infra-inguinal artery bypass graft surgery. Acta Anaesthesiol Scand, 2008;52;721-722. Asakura, Y, Mizuno, T, Kato, N, Kandatsu, N, Fujiwara, Y, Komatsu, T. Respiratory status that facilitates subclavian venous catheterization. Acta Anaesthesiol Scand, 2008;52;867-869. Asakura, Y, Kandatsu, N, Hashimoto, A, Kamiya, M, Akashi, M, Komatsu, T. Ultrasound-guided neuroaxial anesthesia: accurate diagnosis of spina bifida occulta by ultrasonography. J Anesth, 2009;23;312-313. Asakura, Y, Nakamichi, Y, Mori, K, Ibuki, K, Kasuga, H, Hori, H. Ultrasound-guided central venous catheterization: efficacy of simultaneous perioperative ultrasonographic scanning for the presence of carotid plaques in the prevention of the perioperative development of ischemic stroke. J Anesth, 2012;26;621-622.